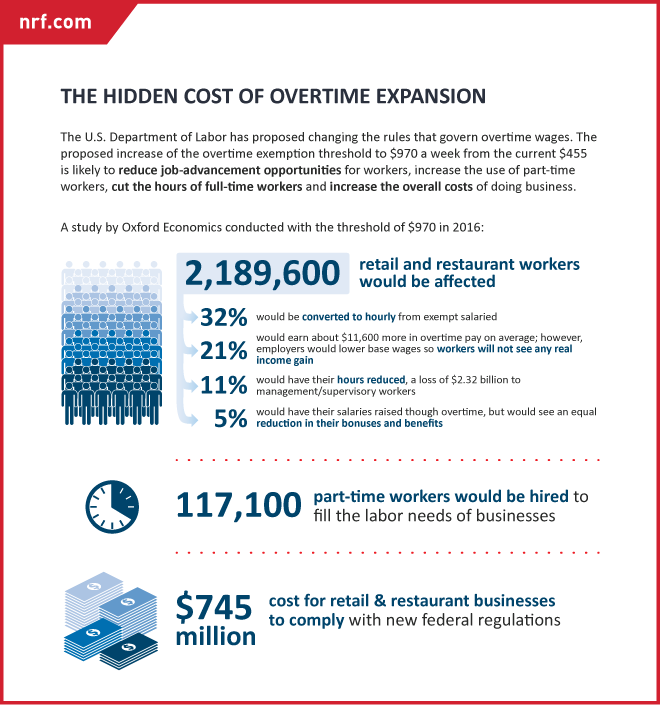 The Department of Labor has proposed a major change in federal regulations governing overtime pay that could have a significant impact on the retail industry. Under current rules, workers making up to $455 a week are automatically entitled to overtime if they work more than 40 hours a week. Managers and professionals who make more can be declared exempt, but only if they meet certain conditions such as having supervision of other workers as their primary duty. Under the proposed changes, the wage threshold would be increased to $970 a week, and the administration is asking whether additional restrictions should be placed on non-supervisory duties managers can perform and still be considered exempt. To better understand the effects of the proposal, NRF commissioned the research firm Oxford Economics to conduct a study. While raising the threshold would mandate overtime pay for many workers, the analysis found that most employees would not actually see a change in net pay. Instead, many employees would see their hours reduced so that overtime would not be worked, while others would see their base wages, benefits or bonus pay decreased in order the offset the added payroll expense. The study also found that updating payroll systems, establishing ways to track employee hours and other administrative expenses would cost the restaurant and retail industries alone an estimated $745 million even if workers saw no additional take-home pay. The original study was prepared before the Labor Department proposal was released, and was conducted with projected wage thresholds that might have been proposed. This update has been prepared based on the actual proposal.